After looking for a location for their barbecue restaurant “from the far east to way out in Novi and Washtenaw,” as Drew Ciora puts it, he and Rick Ghersi found the ideal spot in the last place they were looking: less than a block away from Ciora’s Royal Oak Brewery. 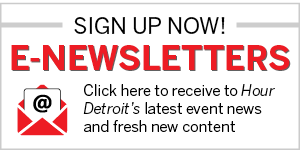 The business partners had been mulling over the idea for a barbecue restaurant since 2006, when they were smoking ribs for the Super Bowl crowd on the sidewalk outside their Detroit Beer Company. While insisting that we do have good barbecue, Ghersi did admit that it can be hard to find. The pair began visiting barbecue spots in Texas, Memphis, and Kansas City, and the idea took off, culminating in the creation of Lockhart’s BBQ, named for the Texas town where barbecue is practically religion. After scouting unsuccessfully for a location, they ended up back in Royal Oak, where the sturdy brick building at the corner of Third and Williams was available. The liquor license was the biggest challenge, Ciora says. There were none left in Royal Oak, but they found one in Novi, and were able to buy it. Then they ran into another stumbling block. The first time they went to the city of Royal Oak to get approval for the project, they were turned down. They made some adjustments, including limiting the indoor seating to 100, went back again and got the go-ahead. They began work on the space in January, bringing it up to code with new wiring, plumbing, and electrical. Lockhart’s opened in August, with pit master Steve “Bubba” Coddington handling the smoker brought in from Mesquite, Texas, in the open kitchen that’s the heart of the big, high-ceilinged dining room. House-made barbecue sauces are provided on the tables for those who want them, however. While there are a few other dishes on the menu, including fried catfish, almost everything involves barbecued pork, beef, chicken, or sausage. 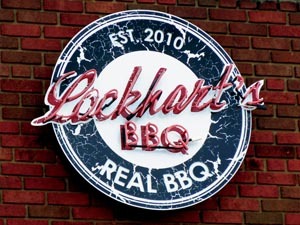 202 E. Third St., Royal Oak; 248-584-4227, lockhartsbbq.com. Open seven days.